One in four 20-year-olds will become disabled before they retire, according to the Council for Disability Awareness. One in four 20-year-olds will become disabled before they retire, according to the Council for Disability Awareness. When that happens, people immediately look at the impact it will have on their job and their paycheck. But what about their retirement? According to the Employee Retirement Income Security Act, a person who ends up on long-term disability and is no longer on a company’s payroll is prohibited from making contributions to a 401(k) or other defined contribution retirement plan. Hinson’s company devised a new type of insurance that protects retirement plan participants from the threat of disability by ensuring their retirement savings. Pension Advisory and Pro Financial Services in Chicago, Ill., are offering what they call Retirement Income Assurance Policy, a group long-term disability insurance product. 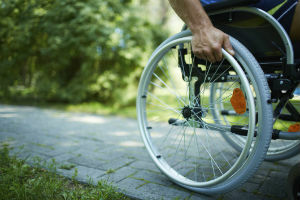 Under the program, group long-term disability insurance is purchased by an employer to protect employees who participate in the company’s qualified defined contribution plan. If a 44-year-old worker became disabled, but they were paying in $1,000 a month to retirement savings with a 50 percent employer match, the insurance would keep paying that $1,500 a month into an annuity on behalf of the disabled individual, Hinson said. Without such a plan, a person who became disabled at age 50 and was on long-term disability for a year would see their retirement plan decreased by $37,421 at the age of 65. If they are disabled for five years, their retirement account would diminish by $170,113. If they never go back to work, they could lose out on more than $400,000 in retirement funds, Hinson said. Pension Advisory and Pro Financial hired American National Bank to be its fiduciary trustee. The bank shops the market to see which annuity is best for each disabled individual. The annuity is then held in a bank custodial account on behalf of the individual until he reaches age 65. If a person passes away before age 65, her family receives the benefits, he said. The Air Line Pilots Association International, the world’s largest pilots union with 50,000 members, asked Pension Advisory Group to build a plan for its commercial airline pilots. It also is building a plan for a flight attendants union. The company now plans to market its product to lawyers, accountants, engineers and universities. If a person suffers long-term disability, “it really makes sense to cover this because if you lost your job to disability, you are going to receive 60 or 70 percent of your income, which is still taxable, and now you don’t have the money to save for retirement,” Hinson said. He added that his company felt there was a real niche in the marketplace for this product. The benefit costs the employer a fraction of the total plan assets, but it doesn’t cost participants anything, he said. “Let’s face it, defined benefit plans are a thing of the past. They are a dinosaur. Now we’ve shifted to 401(k)s. In a DB plan, if you got sick or disabled, you would continue accruing benefits. In DC plans, you don’t accrue anything except interest on what you have in your account,” Hinson said.